As a college student who cannot have gluten or dairy, I have had to miss out on one of the greatest indulgences of college life: macaroni and cheese. While I certainly have found plenty of other delicious foods to fuel late night study sessions and finals week madness, there's truly no equal replacement for mac and cheese that I have found in my many years sans gluten and dairy. Luckily, the food wizards over at Daiya set out to prove to the world that a macaroni and cheese without "normal" noodles and "normal" cheese can be everything I have been craving and so much more. Without giving too much away, I can say that all three varieties of cheezy mac totally rocked my world and are definitely a must-have pantry item for kids of all ages (adults too)! The three flavors of cheezy mac that are currently in production are cheddar, alfredo, and white cheddar with veggies. All three mixes are vegan and free from gluten, dairy (and lactose), and soy. Each serving has a decent amount of protein (5-6 g per serving) and makes enough for three servings (for me each box made two meals). The pasta in each box is brown rice pasta and the "cheeze" sauce is made using an oil base (coconut, safflower, and canola). The cook process is simple enough, and takes 20 minutes tops, making it super simple for me to cook up a pot of creamy goodness whenever a cheezy mac mood strikes. To prepare, simply cook noodles in boiling water for 7 minutes, drain, add cheeze sauce, then mix and enjoy. Of course, the first cheezy mac to be put to the test would have to be the classic yellow cheddar variety. Of the three, I had the highest expectations for this one, as I grew up with the gluten and dairy-full variety. Once cooked up, the cheezy mac was wonderfully golden with gooey cheese- pretty much everything I had hoped for. The taste itself is incredible, as the noodles cook up to a perfect consistency and the cheese achieves a level of creamy "cheeze-ness" that I thought was impossible for vegan cheese. The cheddar flavor was amazingly life-like. If I had any doubts, one spoonful crushed them all: Daiya totally nailed the taste, texture, and appearance of this cheeze mac! Next to the test was the white cheddar and veggies variety. I like how this cheezy mac adds a little extra health boost by including peas, peppers, and carrots. Again, this performed beautifully, cooking up to a perfect pasta, creamy sauce, and tender vegetables. I loved the sharpness of the white cheddar, which was not as mild as it's yellow cousin. While I really liked the vegetables mixed in, I would like to see a plain white cheddar variety, just so I have the option to choose if I want the added flavors and textures. Last, but not least of the test batches I made was the alfredo style. Unlike the yellow and white cheddars, alfredo is a flavor I do not miss, nor was fond of when I could eat the cream-laden sauce. Here, as with the other two, the cooked noodles and sauce came out perfectly once again. The sauce reminded me of the white cheddar, but had its own distinct profile with a hint of garlic and other spices. I was surprised how much I liked this style, and know it would be great paired with rotisserie chicken and peas for the ultimate comforting meal. 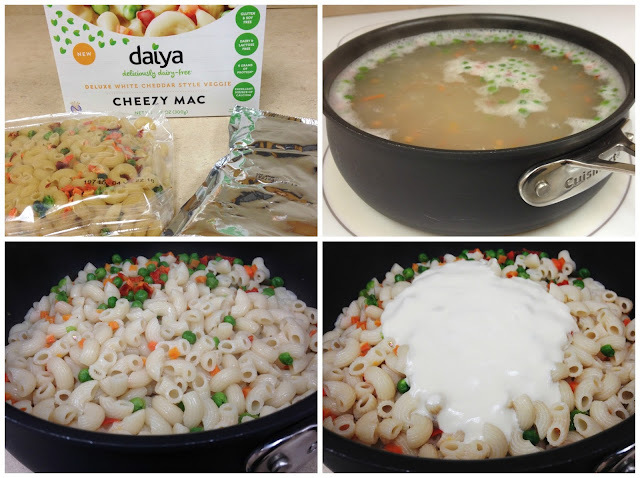 Without a doubt, Daiya totally nailed vegan and gluten-free "mac and cheese" in my book. It's such a luxury to be able to enjoy the ultimate of comfort foods once again now that cooler weather leaves me craving this normally off limits pasta. Having dietary restrictions does not mean that I should have to miss out on the staples of college life, and I am so glad that Daiya is committed to opening those doors for those of us with food allergies, restrictions, or other special diets. I found all three cheezy macs at my local Whole Foods Market. Click here to access Daiya's product locator to find them near you.